PRASAG was launched in October 2015 by Samantha Cox in memory of her father Paul Readhead. Sam has personal experience of mesothelioma after caring for her father. 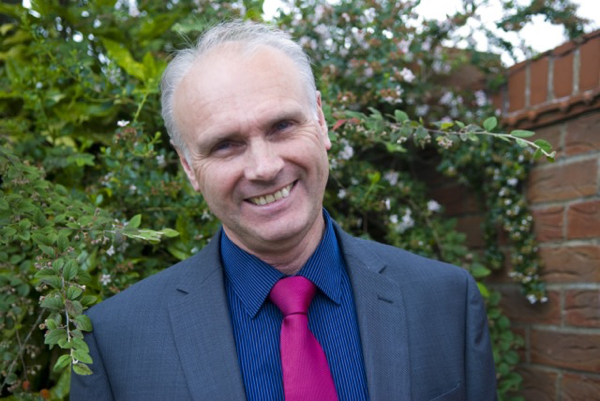 Sam is a qualified counsellor and a registered member of the BACP and has trained with CRUSE Bereavement. During her father's illness it highlighted to her the need for a holistic approach, encompassing emotional, physical, social and financial wellbeing. This was the beginning of PRASAG and with considerable support from her sister in law Lucy Reynoldson, Chris Knighton MBE (MKMRF), Leah Taylor (Mesothelioma UK), Lynne and Lisa (HASAG) the support group became a reality. 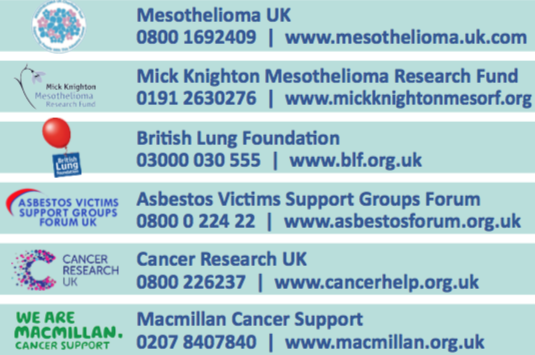 Each group is attended by Leah Taylor, Mesothelioma UK Clinical Nurse Specialist who provides information about Mesothelioma, including symptoms, treatments and clinical trials. Solicitors attend the monthly group to provide no obligation advice and support. Our meetings are social and informal in a warm and friendly environment for people affected by asbestos related disease and their carers. Prize giving by: Rob Smedley, newly appointed F1 Expert Technical Consultant and former F1 Race Engineer for Ferrari and Head of Vehicle Performance for Williams. Time: Arrival at 16:30, team briefing, qualifying and racing from 17:00. Food and Drink: Food and drink (not included in entry fee) will be available throughout and following the race in the restaurant at the circuit. Friday 12th to Sunday 14th July 2019: 2-day sponsored Coast and Castles 200 mile Edinburgh to Newcastle Cycling Challenge. Friday night in Edinburgh, cycle Saturday, Saturday night in Berwick, cycle to Tynemouth finish on Sunday. Paid entry and sponsorship required. Summer 2019 date TBC: Charity Golf Day, location TBC. Paid entry and sponsorship required. Late August 2019: Sponsored Hadrian’s Wall Family Walk, with overnight camping stop and barbeque! Saturday walking, Saturday overnight camp at a farm with great facilities, Sunday walking. 11th February 2019: We are delighted to report that JDR Cable Systems Ltd announce that their chosen charity for 2019 will be Mesothelioma UK and PRASAG (50/50). This is the first time that JDR in the UK are collectively supporting one charity and group across all of their sites, to include Hartlepool, Newcastle and Littleport. More information about JDR's ongoing support for charity can be found at www.JDRCharityEvents.co.uk. November 5th 2018: My name is Joanne Murray. I am delighted to be formally joining the PRASAG support group. In my day job I work as a Children's Community Nurse in Middlesbrough. I am a Wife, Mam, Sister & the Daughter of a Dad lost to Mesothelioma. Today I find myself somewhere I really never wanted to be, somewhere previously only a nightmare would take me! I'm here in this place because my lovely Dad died last year on August 8th of Mesothelioma. Some of you may have known Dad, a strong healthy man before his exposure to asbestos many years before his 2015 diagnosis, resulted in him developing Mesothelioma! During Dads Meso journey we were introduced to PRASAG support group. We were devastated, scared and alone after Dads diagnosis and PRASAG offered us hope and a lifeline. It was a place where we could talk openly where no one judges or pities you, just offers hope, help and support. PRASAG empowered and facilitated us to fight on, seeking out expert medical & nursing opinions, treatments and trials. During the monthly meetings there is also the opportunity to meet and consult with the various solicitors who are there representing their law firms. Everyone receives a warm and loving welcome at PRASAG. We were delighted to announce a grand prix dinner which was be held on Saturday 2nd June 2018 at Ramside Hall Hotel, Durham. 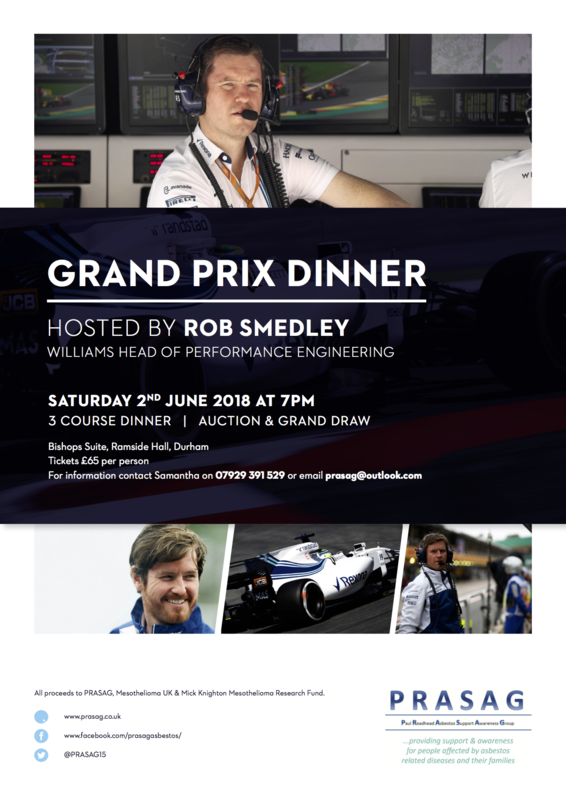 The evening was hosted by Rob Smedley, Head of Performance Engineering, Williams F1 Racing team.